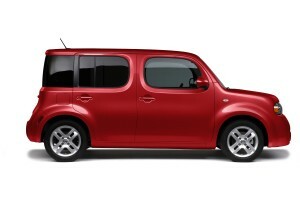 The 2011 Nissan Cube continues to enhance its standing as a global icon — fun, functional, fresh and fashionable. With its asymmetrical rear window, refrigerator-style rear door and wide range of personal accessories, Cube enters 2011 with just a few enhancements. At first glance, the Nissan Cube’s appearance seems to embody the simplistic nature of its name — a box on wheels. But a closer look reveals a more complex and intricate design with a surprising sense of dynamic movement. The centerpiece of Cube’s universal appeal is its “social space” — the surprisingly roomy interior that offers room for five in lounge-like comfort. The interactive interior is anchored by its curve-themed architecture, such as the subtle wavy shaping of the instrument panel, door panels, seat shapes, armrests, and the iconic circular/oval shapes of elements ranging from air conditioning vents, door pulls and climate controls. Cube combines an advanced 122-horsepower 1.8-liter 4-cylinder with a choice of Nissan Xtronic Continuously Variable Transmission or 6-speed manual transmission for good acceleration response, smooth operation and fuel efficiency. More than 40 individual accessories are offered — ranging from a unique 20 Color Interior Accent Lighting kit and “shag dash toppers” to aerodynamic body kits and custom wheels — allowing Nissan Cube owners to personalize their vehicles to reflect their own tastes and needs. Other accessories include illuminated stainless kick plates, rear cargo area organizer, aluminum alloy wheels, aero kits and more.